This field demonstration project, which was part of the SHRP 2 R02 project, Geotechnical Solutions for Soil Improvement, Rapid Embankment Construction, and Stabilization of the Pavement Working Platform, was conducted on the SR9B construction project in Jacksonville, Florida from May 16 to May 19, 2011. 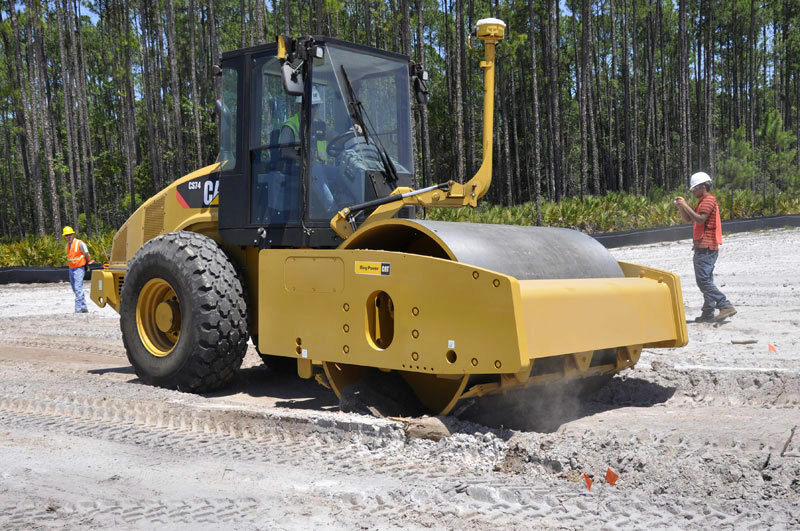 A Caterpillar CS74 vibratory smooth drum self-propelled roller weighing about 34,000 pounds was used on the project. The machine was setup with a roller-integrated compaction monitoring (RICM) system. 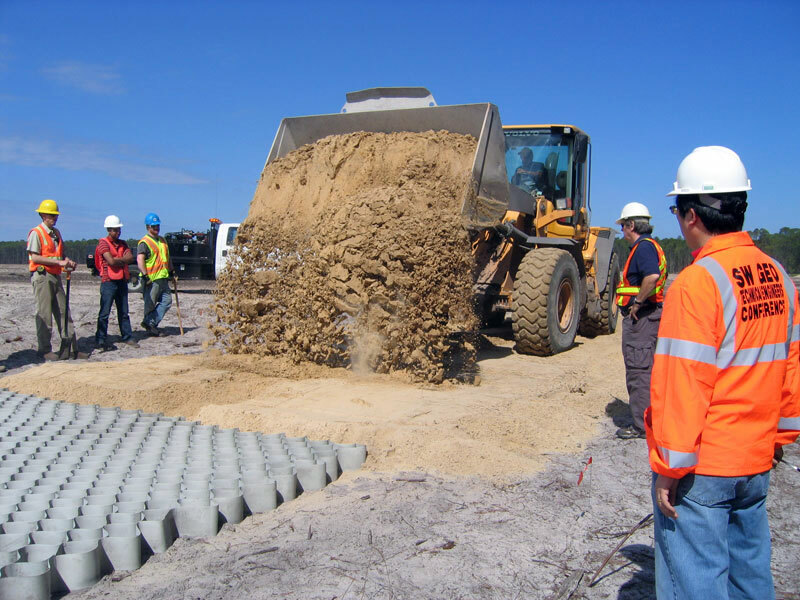 Four test beds (TBs) were constructed and tested using the on-site poorly-graded sand embankment fill (A-3 according to the AASHTO classification system). 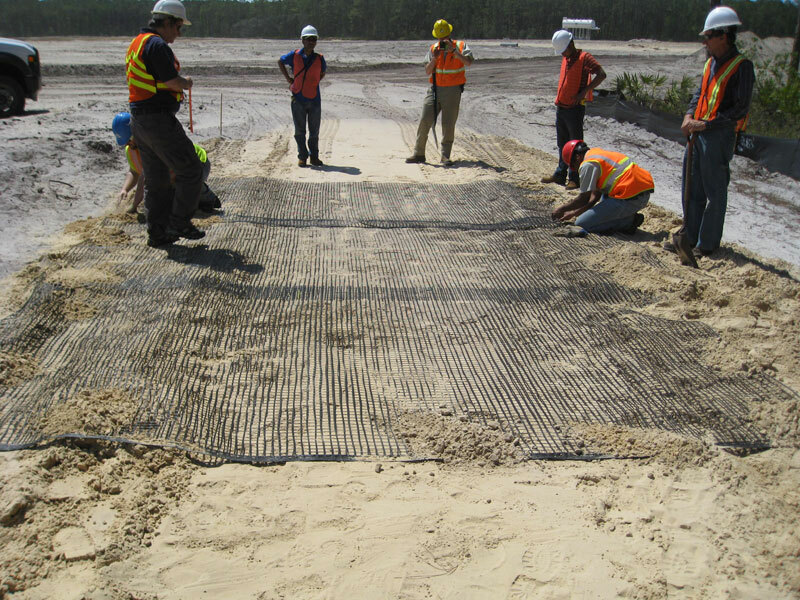 TB1 involved constructing six test sections incorporating several different geosynthetic reinforcement materials: biaxial geogrid (BX), geogrid/nonwoven geotextile geocomposite (C30), polypropylene woven fabric (PPWF), and 100 mm or 150 mm geocell (GC) materials, and one control section. TB2 involved compacting a thick loose lift (about 1.2 m deep) in two sections–one with BX geogrid reinforcement and one without reinforcement. TBs 3 and 4 involved mapping project production areas using the RICM roller and selecting test locations based on the color-coded on-board computer display in the roller for in situ testing.